Darien CT Wedding Photos show a small, historic town in Fairfield County, Connecticut. Located on Connecticut's "Gold Coast", this affluent, suburban community has been shaped by its location on the shore of Long Island Sound. It is a main route from Boston to New York City, a trip that initially was only made by water passage or by traveling dirt roads. The village was once a part of Stamford, Connecticut, but eventually split off from the city and naming the town became a point of contention for residents who all wanted to it be named after their families. The town was finally dubbed Darien by a sailor who had traveled to Darien, Panama and just happened to like the sound of it. Darien CT Wedding Photos are unique in their posh, yet comfortable small town feel. 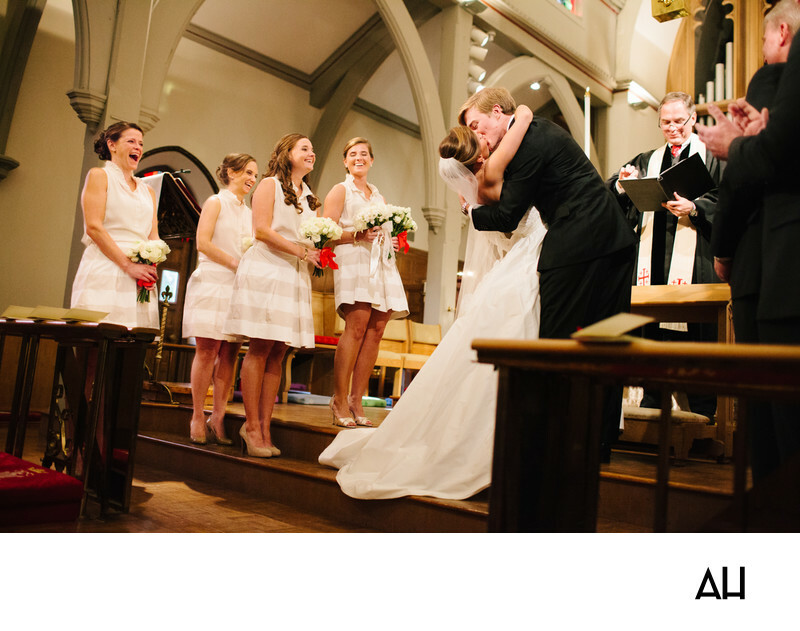 In this image, the groom surprises the bridal party and guests by tipping his bride back for a dramatic first kiss as newlyweds. The bride’s gown fans out behind her and she wraps her arms around her husband, embracing their new future. To the right of the couple the groomsmen clapp and the priest chuckles. The four bridesmaids also laugh happily at the scene, enthralled in the day’s jubilation. The bridesmaids wear matching knee length, white and beige striped skirts paired with white blouses. The blouses are sleeveless with ruffled collars that come up high on the sides of the girls’ necks. Their shoes do not match, but each does wear a neutral heel, in harmony with the pale colors of their skirts. The girls hold bouquet of white roses, the maid of honor holding the bride's white flowers as well as her own. It is a joyful, pleasant scene, one that will live on in the memories of all who attended the wedding.